This is a Sharp-shinned Hawk, a bird that nests in the northern half of our state, and throughout Canada. It's the smallest member of the Accipiter family -- Sharp-shinned, Cooper's, and Goshawk, the latter the largest. Sharpies, forest birds, feed almost exclusivly on the songbirds it finds there. It migrates, beginning in August. Hawk Ridged in Duluth is an excellent place to see this bird. 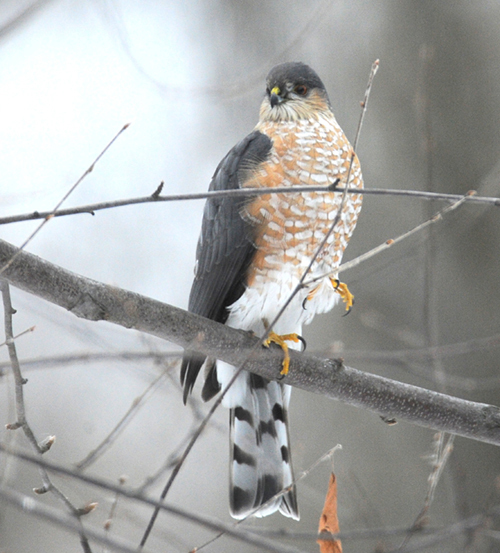 Cooper's Hawk takes small mammals and birds throughout North America. It often is an urban and suburban nester. If there is a hawk hunting birds at your feeder, it almost certainly is Cooper's. Goshawks are residents of our northern forests. They nest in Minnesota in small numbers. They are best seen in migration, Hawk Ridge again a good place to see them. Not all Goshawks migrate, however, movement based on the availability of the small mammals, Ruffed Grouse, and the larger songbirds it takes. A Gos was seen several times in December just outside of Hyland Park in Bloomington, on one occasion hunting a Gray Squirrel. The Sharpie pictured spent a few minutes in our yard in mid-December, waiting for the return of the feeder birds that fled upon its arrival. No luck. It moved on.